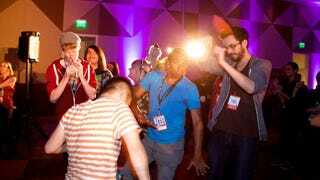 I recently wrote a lengthy piece about GaymerX, my favorite games convention I've ever attended, and why its chances of surviving another year were nearly non-existent. Now, however, its organizers have taken to Kickstarter. Perhaps there's hope yet. The Kickstarter is looking to raise $80,000, which is actually only about half of what the LGBTQ-friendly convention will need to roll out its rainbow-colored red carpet. The rest will be covered by sponsors and things of the like. There's a budget breakdown on the page, if you're interested. "We've become more and more aware that not all of our attendees identify with the 'gaymer' label. And while we love all our gay dude friends, we realize there are more people than that who want an awesome space to hang with their friends in a safe and diverse environment. We want to make sure we represent everyone who feels like they've been left out of mainstream gamer culture." Here's the thing, though: GaymerX—while a marvelously positive place to enjoy games and gaming culture—hasn't always been so water-tight on the business side of things. Most recently they had a fairly public kerfuffle involving unpaid sponsor fees from Disgaea publisher NIS America, and the con's whole reason for nearly going bye-bye once and for all was money and some rather costly mistakes. "Our first year, we didn't really know what we were doing and had to try to figure it out on the fly. Because of this, we hit a lot of unexpected roadblocks, expenses, and last minutes issues. With GaymerX2, we had a plan and knew what we wanted to do, but went with a venue that was extremely costly and overestimated attendance." "By doing this Kickstarter first before we sign any contracts, we can make sure we produce GX3 within our means on a sustainable level. We're also doing the event in the late part of the year, when it's off peak for the Bay Area and room rates are far lower." If the Kickstarter is successful, GX3 will take place in the Bay Area sometime around November or December of 2015. Contributing $60 or more nabs you a ticket. Are you interested in going? Think you'll chip in?